The Acai Bowl is probably one of the most insta-famous dishes around at the moment. For the last few years, I definitely thought it was pronounced AH-KAI but turns out the correct pronunciation is AH-SIGH-EE. I hope you are also looking back at all the times you ordered an ‘Ah-Kai’ bowl for your brunch and the waiter rolled their eyes at you; It wasn’t just because he knew you were going to immediately put a photo on Insta… it was because you were pronouncing it like a moron. Well that, AND the insta thing. It’s these incredible benefits that have given Açaí an A-list following, but admittedly, unless you are one of those celebs, you probably can’t afford to go out for breakfast daily to fork out £8 for your bowl. Luckily, you can just make them yourself at home using Sambazon, the world’s leading producer of Açaí. Sambazon is on a mission to bring real Açaí to the UK, establishing it as a delicious health food staple, just like it is in the States, Japan, Australia and its home country of Brazil, where for many it is part of the daily diet. Açaí grows on tall, slender palm trees in the Amazon Rainforest. It is one of the only fruits on the planet to be naturally sugar free, packed with antioxidants, and full of healthy omegas, fibre and protein. Taking its name from its core goal, Sambazon stands for the Sustainable Management of the Brazilian Amazon. Each delicious purchase not only helps to boost health with antioxidants and omegas, but also helps to preserve the rainforest and the families that farm there, which is wonderful. Sambazon Açaí has an exotic purple colour, creamy mouth-feel and an earthy taste with notes of chocolate. It is perfect for pairing with healthy toppings, such as nut butters, fresh fruit and cacao nibs or simply sprinkled with berries, granola or coconut shavings in a nutritious Sambazon bowl. The bowls are ideal for enjoying as a brain and body-boosting breakfast, filling lunchtime, pre and post exercise, healthy snack or as an after-dinner treat. To make the perfect Açaí bowl, simply remove two pouches from the freezer and run under the tap for ten seconds before adding to a high-powered blender with half a banana or berries and a splash of non-dairy milk. Add toppings (fruit, nuts, chia seeds, anything!) and serve immediately. I whizzed up two pouches with a banana and a cup of the oat milk in my Breville Active Blend, before pouring it out into bowls and topping with blueberries, coconut, dried cranberries, golden raisins and granola. This is where you make it Insta-worthy. 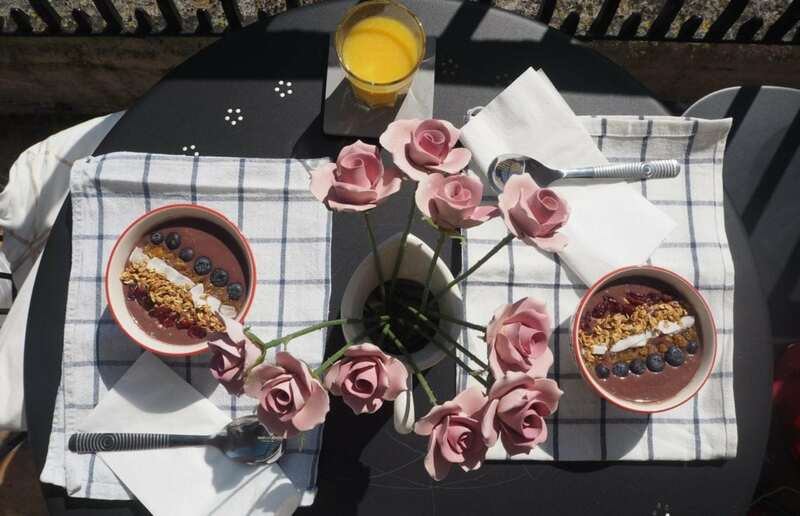 On beautiful hot days like these, there is nowhere better to enjoy a delicious cold Açai bowl than on your balcony. I don’t think I’ve ever made a more impressive, yet simple and quick breakfast. The time consumption came with my precise decoration on the top, but if you’re not planning to photograph it to within an inch of its life you can just chuck it all on and get feasting! It really is SO easy, and incredibly tasty. It took no more than 5 minutes from start to finish. All Sambazon products are 100% organic, Fairtrade, vegan, non-GMO, gluten-free and Kosher. The packs are available in the freezer aisle at Whole Foods Market, Tesco and Ocado for RRP £4.00, far cheaper than ordering in a cafe, and as the packs are nice and compact, they don’t take up much room in your freezer either. ideal! Of course, if you still can’t be bothered to make your own (lazy much?) you can grab a Sambazon Açaí bowl to-go in Whole Foods Piccadilly, Kensington, Richmond & Fulham. Just head to the juice bar. And remember, its AH-SIGH-EE, not AH-KAI.